Hey Guys! I know it's nearly the end of March and January feels so far away but I've been a bit forgetful with posts like this so I wanted to round up the past two months by sharing (most of) my Instagram posts. January started off with a River Island Fashion on Film event during London Collections: Men for our James Long Design Forum collection. I had a "I Feel Lauren Conrad Moment" when working the door with the guest list. And looking at David Gandy was quite nice! A new London drinking gem was found - The Madison rooftop bar near St Paul! The views are incredible, the blankets are cozy and the cosmopolitans are soooo yummy! The beginning of February was busy with River Island's High Summer Press Day. Amongst all of the excitement of looking at new Summer pieces, making a mental list of the bikinis I'll be wearing, talking to press & bloggers and eating the Fish Dogs, we made the most of the photo booth! Shortly after London Fashion Week came along. For the first time ever I visited Somerset House on Saturday with Hayley and Josie to see all of the excitement and outfits. 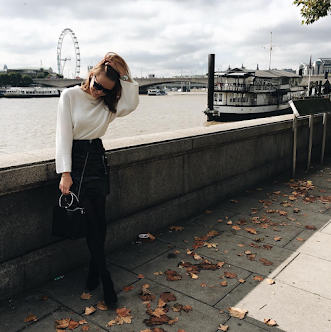 After having a walk around taking street style photos and shooting our own outfit pictures we headed over to the ME Hotel to admire the view and chat over tea. Our River Island's Fashion on Film event happened on the following Monday for our Jean-Pierre Braganza Design Forum collaboration. Getting up at 5:30am wasn't fun but to be part of a LFW event was so fun! February ended with a shoot for Company Online's Office Style Blog - read the post here! It was such a great opportunity I couldn't say no! Although I was pretty nervous how the images and interview would turn out (I'm not very good at talking on the spot), it was amazing to be featured! Other highlights included visiting Windsor, a Laura Mvula event, breakfast at Berner's Tavern with Cosmopolitan magazine, Tea at Jigsaw and outfit shooting. What have you been up to in January and February?